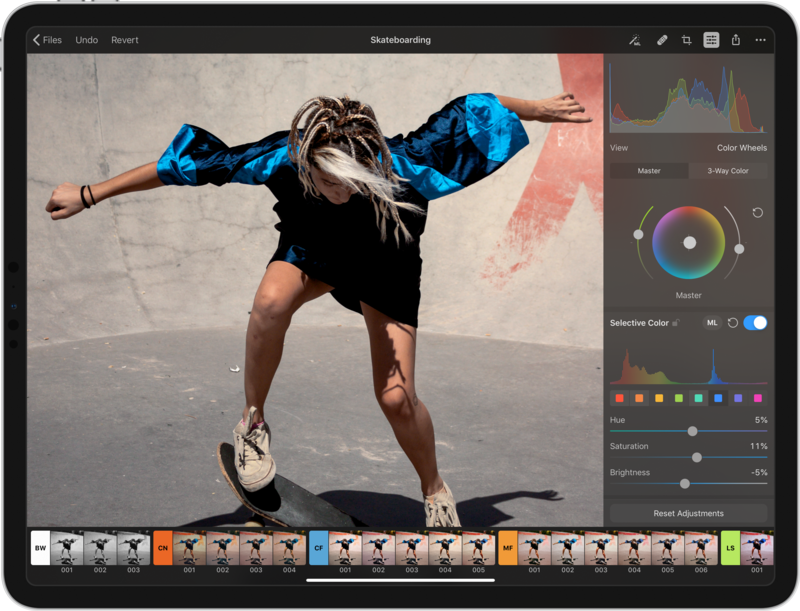 Vilnius, Lithuania - The Pixelmator Team today announced its latest app, the AI-powered Pixelmator Photo, will be released on April 9th and is now available for pre-order from the App Store with a 20% discount off its launch price. Pixelmator Photo gives photographers all the tools they need to edit photos on iPad - a collection of nondestructive, desktop-class color adjustments, AI that enhances photographs like a pro photographer, full RAW support, a magical Repair tool to remove unwanted objects from photos, a set of gorgeous presets inspired by analog photographic films, and more. "Pixelmator Photo is an unbelievably powerful and incredibly easy to use photo editor for iPad," said Saulius Dailide, one of the founders of the Pixelmator Team. "It brings an extensive collection of tools that experienced photographers know and love but, thanks to its clean and intuitive interface, it makes these powerful tools accessible even to beginner users. And with ML Enhance, the most intelligent and advanced automatic photo enhancement tool in any app, truly anyone can create great-looking shots in seconds." With an extensive collection of powerful, nondestructive color adjustments, Pixelmator Photo brings a desktop photo editing experience to iPad. It includes foundational tools like Brightness, Exposure, and Shadows & Highlights, time-tested photo editing classics, such as Levels and Curves, as well adjustments for adding film-style grain, selectively adjusting colors, correcting white balance, and many others. What's more, the Repair and Crop tools let photographers perfect all the details that go into great-looking shots, like removing blemishes or unwanted objects, as well as adjusting the composition of photos, their perspective, and more. The magical Repair tool, enhanced by machine learning, lets users easily remove blemishes, imperfections, and even entire objects from photos. 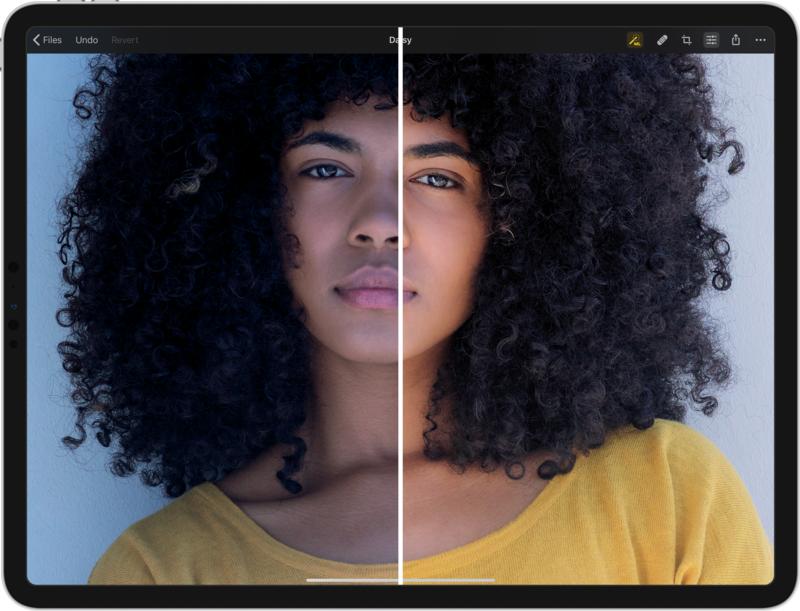 The Repair tool recreates complex backgrounds with ease, so even if you didn't quite get the perfect shot the first time around, you can use image editing magic to make sure the final photo looks its best. Founded in 2007 by two brothers, Saulius Dailide and Aidas Dailide, the Pixelmator Team develops powerful image editing apps for Mac and iOS. The team's apps have been honored with multiple Mac App of the Year awards, an iPad App of the Year award, an Apple Design Award, and many others. Pixelmator for iPad was featured at the Apple Special Event in October 2014. All Material and Software (C) Copyright 2007-2019 Pixelmator. All Rights Reserved. Apple, the Apple logo, Macintosh, iPhone, iPad, and macOS are registered trademarks of Apple Inc. in the U.S. and/or other countries. Other trademarks and registered trademarks may be the property of their respective owners.